Widely known throughout the world for its traditional Salentine cuisine, the renowned Restaurant Alle due corti®, is throwing open its kitchen and making space available to the Maestra di Cucina, the Signora Rosalba De Carlo. For those wanting to get to know Rosalba and share with her this marvellous journey through the ancient traditions of the food and wine of Salento, classes and courses have been organized starting from October. These will provide the chance to get one’s hands dirty, but above all, to share her knowledge of these ancient traditions and culture. It’s a way of getting to know Salento and also to be able to take a piece home. Rosalba imparts her knowledge of what is at the heart of the real Salentine cuisine, that which is made up of traditional flavours and old fashioned recipes. The classes with Rosalba are not simply a ‘cooking course’ but a pathway of learning which commences with the basics. She starts with the preparation of the sauces and pasta, the knowledge and choice of the ingredients and all the steps which will enable participants to reproduce the same recipes at home for family and friends. The three day course will be hosted by the Restaurant Alle due corti® starting at 10:30 each day and going until late in the afternoon. Lunch will be served in the restaurant’s dining room. For the occasion, the Restaurant Alle due corti® will be closed to the public in order to offer the space exclusively to course participants who, at the end of each day, will be able to taste the fruit of their work with Rosalba. • Lunch will also provide an opportunity for tasting local wines from Salento matched with the dishes prepared each morning. Giorgio Grassi, Rosalba’s son will be working alongside her. Giorgio is specialized in wines of local production. • After lunch is over, the course participants can take away what remains of the dishes prepared that day, thus being provided with a wonderful dinner according to the local custom. • At the conclusion of the three day course, participants will receive a personalised certificate of attendance issued by Alle due corti® and photographs of all of Rosalba’s courses and participants will be published on the dedicated internet site. • Course notes will also be provided, in English, Japanese or Italian, with important points from the lessons and background information on what will be prepared together in the kitchen. The course notes have been prepared by Rosalba’s daughter, Marinella Grassi. 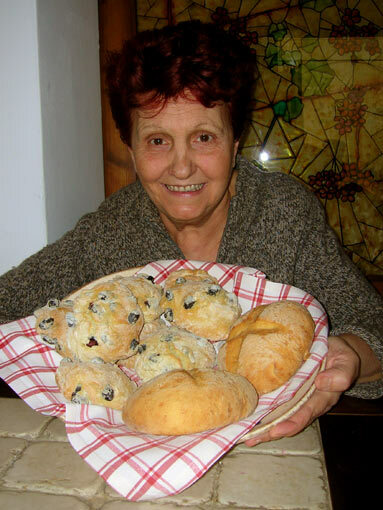 With her extensive knowledge of local traditions, Marinella has provided detailed historical notes on the foods which are fundamental in understanding the strong ties between the land, the seasons, the culture, the ancient religion, and all the elements which render the flavours of the local dishes genuine. Marinella, along with Giorgio, will also be present during the course. • An English or Japanese speaking interpreter will also be present both during the lessons and at meal time. • In addition to this, participants will be accommodated in a nearby hotel or, better, a luxurious bed and breakfast in Lecce’s historical centre. The accommodation is at an easy walking distance from the Restaurant Alle due corti® among the splendid baroque churches, piazzas and laneways of other times (4 nights). • Above all else, it’s the relaxed family atmosphere that Rosabla creates around her and shares with others which is the true added extra. Rosalba’s lessons light heartedly unfold in complete harmony between kitchen and table; it’s impossible to talk about food with passion without being at peace with the world. Indeed, Rosalba not only makes her restaurant available, she gives all of herself and her family for these three days shared together, studying, learning new things and chatting and eating like old friends might. Food is one of the most healthy emotional experiences, because from the exterior it enters and becomes part of us. It transforms us, helps us to grow and enriches us, thanks to its history and the history of the land which produced it.